LOVE OUR SHOW & WANT TO PROMOTE YOUR BUSINESS, PRODUCT OR SERVICE? SPONSOR AN EPISODE OF REAL 101! We showcase your logo, name, and website before the episode! Video Posted To Our YouTube Channel, & Showcased On Our Website! Video Promoted To 30,000+ Social Media Following! Our show provides an awesome PLATFORM to promote your business, product or service to HOME BUYERS, SELLERS, INVESTORS, FLIPPERS & RENOVATORS! Real Estate 101 is a real estate show exploring all things real estate. Home buyers and sellers watch and love our show because they learn all about buying, selling, investing, building or renovating real estate from industry professionals! What Are The Benefits Of Sponsoring An Episode? By sponsoring an episode, we can expose and promote your business, product or services to home buyers, sellers, investors, flippers & renovators. Sponsor an episode for a one time cost and you will continue to get exposure and promotion for many years to come long after you paid. Referrals are proven to be the best form of advertising, and nothing beats your business, product or service mentioned on camera to viewers! 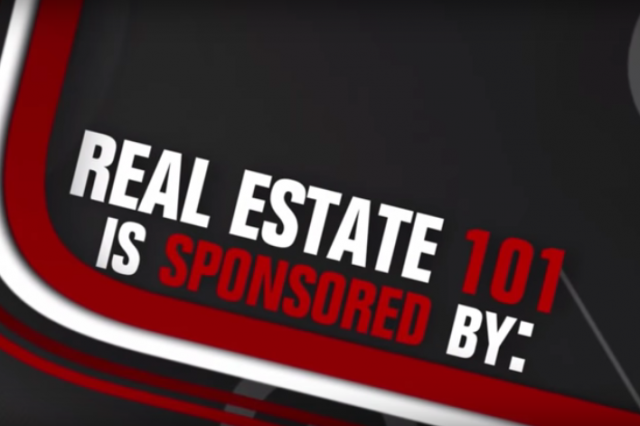 Sponsor An Episode Of Real Estate 101 Today! Get Your Sponsored Episode & Start Promoting Your Business, Product Or Service Today!